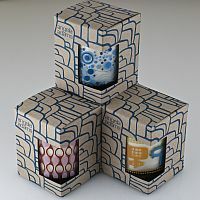 Artist and designer Angela Adams has created a line of eco-friendly scented soy candles in glass tumblers that feature painted natural scenes. Angela also designs hand-woven rugs, bedding and home accessories. There are eight different designs and scents in the line, but the one I received (shown here) is called Cloud. The artwork depicts whimsical painted clouds and birds in blue. The soy candle is smartly packaged without plastic in a pretty decorated cardboard box. 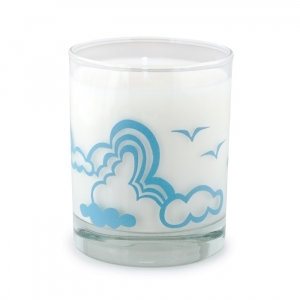 Since this scented candle is 100% soy wax, it lasts a long time and the beautiful tumbler is of course reusable. The cotton wick burns brightly and the lavender scent is more earthy (hippie like?) than floral. My preference leans more towards the floral, but it’s still a pleasant fragrance. The men in my family were mad about it! The suggested retail price of each 7.5 oz. tumbler is $24.95. It’s a little pricey for a candle, but not if you consider that you’re paying for a unique and permanent painted design. Crash Candles is featuring the line, so visit their website to view the remaining candle collection. Crash also features several other candle/art collections by contemporary designers including Zuz Design, Binth and Lotta Jansdotter. Alternately, you can see Angela’s home décor products along with her candles at Angelaadams.com.